Remote-controlled flying machines used to be firmly in the realm of the hobbyist, but the rise of the drones has made the technology available to just about anyone. The problem with most RC planes and copters is that they have spinning rotors which can prove dangerous to nearby wildlife. A much more natural version of the drone is in the works, and it looks and moves so naturally that even other birds can’t tell the difference. The nine-gram bird charges on a small egg-shaped charger. In just 12 minutes it gets enough of a charge for 10 flights of up to eight minutes each. 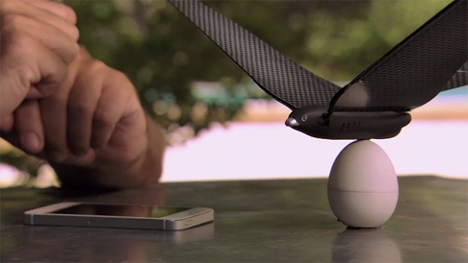 The Bionic Bird is biomimetic, meaning that it is designed to look and act like its natural counterparts. When it’s flying, the Bionic Bird alternately flaps its wings and glides on the air currents. To anyone who isn’t scrutinizing the drone with binoculars, a high-flying Bionic Bird is nearly indistinguishable from the real thing. The bird is controlled via Bluetooth 4.0 from a smartphone or tablet, which makes it easy to fly but also limits your range to about 100 meters. Future planned developments include motion control and support for Android devices. Although we can imagine how much fun the Bionic Bird would be to play with, it’s also a little scary to know that one fitted with a camera could easily go unnoticed basically anywhere. The creators of the bird drone launched a wildly successful IndieGoGo campaign that raised more than 620% of its initial goal. The drone itself and its control programs are still under development, but the system is expected to be fully operational by Spring 2016.